GOSHEN, Ind. and ANGOLA, Ind. – Friday evening and Saturday afternoon proved action-packed as the Goshen College men’s and women’s race-walkers and track and field members opened their 2018 campaign. 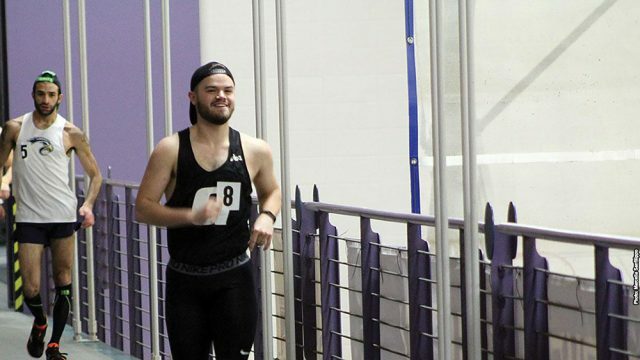 Friday evening in the Roman Gingrich athletic center on the GC campus, Sawyer Biddle, a senior, finished in second place in the men’s race walk division with a time of 14:18 in the 3,000-meter event. Biddle’s pace was his second fastest time of his career and helped the reigning All-American secure a spot in the NAIA national championships beginning on March 1 in Pittsburg, Kansas. Biddle’s qualifying time secures the White Heath, Illinois product, his third-consecutive trip to the national championships. Also competing in the GC Race Walk event was senior Kayla Gray. Gray, a three-time national qualifier in the event, came just 10 seconds shy of qualifying for the NAIA national championships with a time of 17:55. Much like Biddle, Gray’s finish was good enough for a second-place tally. Two Goshen throwers set a personal record in the shot put. Austin Weaver, a senior, took 15th overall with a throw of 39 feet, 5 inches while Jacob Gerber, a first-year, finished 19th overall with a throw of 38 feet, 2 and 3/4 inches. The Goshen men finished seventh overall with a total of 44 points. The Women’s team also competed at Trine University on Saturday. Leading the Maple Leafs was first-year thrower Kassandra Rodriguez in her collegiate field debut. Rodriguez placed first with a throw of 36 feet, 9 inches, winning by more than half a foot. Senior Jill Steinmetz capped off the team’s scoring in the 600-meter run tabbing sixth place with a time of 1:56.26. Junior Mara Beck set a personal record in the 300-meter run with a time of 50.81 seconds.